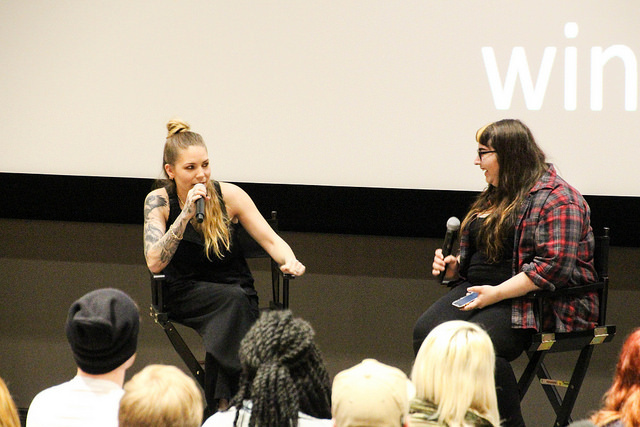 On Fri., April 15, Skylar Grey came to Belmont’s campus before her show later that evening at local club 3rd and Lindsley. Students packed the Johnson Large Theater to hear Grey discuss her trials and travails as an artist, songwriter and young adult. Grey began singing in a folk duo with her mother at the age of six and has been actively involved in the music industry since that time. She dropped out of high school at the age of 17 and moved to Los Angeles to pursue a music career. She began to gain success and recognition co-writing songs, serving as the opening act for artists and releasing original content. “One month I was in a cabin in the woods and the next month I was in Detroit writing with Dr. Dre and Eminem,” said Grey. Grey, who now owns a house in the mountains of Utah, is currently working on her own music and actively touring. Grey has gone on to write for artists such as Brie Larsen, CeeLo Green, Christina Aguilera, Eminem, Foxes, Rihanna, T.I. and Zedd. She has also made special guest appearances on tracks with David Guetta, Deadmau5, Eminem, Fort Minor, Kaskade, Kid Cudi, will.i.am, Yelawolf, and many others. Grey then answered various questions from the students. In regard to her writing process she noted that she, “Always starts with a little germ of an idea that is usually music based such as a chord change or lyrics.” She also answered questions regarding her tour necessities, musical heroes and favorite cities to perform in.